Armira Hotel in Starozagorski Mineral baths, near Stara Zagora in Bulgaria. 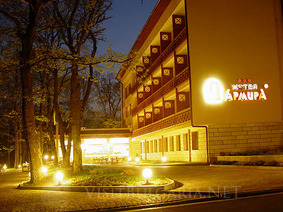 Hotel Complex Armira is named after the ancient Roman villa “Armira”, builed during the rule of the emperor Adrian (117 – 138 AC) in close vicinity to the Ivailovgrad town in Bulgaria. Hotel Complex Armira is situated 12 kilometers away from Stara Zagora in the Starozagorski Mineral Baths resort – a contemporary balneology resort with unique nature and mineral water. Complex Armira offers modernly furnished 18 double rooms, 5 mansards with double bed, 3 standard apartments, 1 mansard apartment De Luxe and 5 luxurious mezonette villas. -	The restaurant of the hotel is for 80 people and offers delicious specialties from the traditional Bulgarian and European cuisine. -	VIP hall – is a separate room served by individual team of waiters. Inhere your comfort is their premium obligation. -	Summer garden 100 seats - is the ultimate way to combine the peace, the splendid view of the surrounding nature and the first class service of the restaurant. -	The Lobby Bar - is always available to every one of our guests. Here you can indulge yourself with our famous cocktails or simply have a drink on the way. The hotel offers a wide indoor swimming pool and a spa centre. The Armira Hotel Complex offers all you need to conduct your business meetings conventions, symposiums, seminars or conferences. This rare combination of favourable conditions is well accepted by the business people and it definitely contributes to the achievement of better final results.